Richard D. Besecker proposed an intriguing project and we just had to help out. 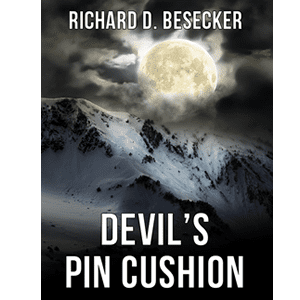 He needed help editing copy, formatting the manuscript, creating the cover art, and publishing his novel, Devil’s Pin Cushion, with an online publisher. After publishing the hard copy, we created and published the e-reader version. The story is full of outdoor adventure, thrilling crime drama, and love scenes. We created a mysterious image for the cover with the title and author text highlighted in an easy to read layout that jumps out from lists of books with online vendors. We even wrote the text for the back cover and bio. It was an amazing project to work on. Be sure to get a copy if you like a storyline full of action. It is available at Lulu.com, Amazon.com, and BarnesandNoble.com.